On March 15, young people from Western New York schools joined the international youth call to Strike School 4 Climate. Fifty young people from City Honors, Olmsted, East Aurora, West Falls, Erie Community College, Canisius and elsewhere marched and chanted at Niagara Square in front of City Hall in the afternoon’s cold winds. They ask: Why go to school if there is no future? This global movement of young people is demanding a future for themselves and the planet, challenging leaders to speak the truth about the severity of the climate crisis and to insist that governments take action. 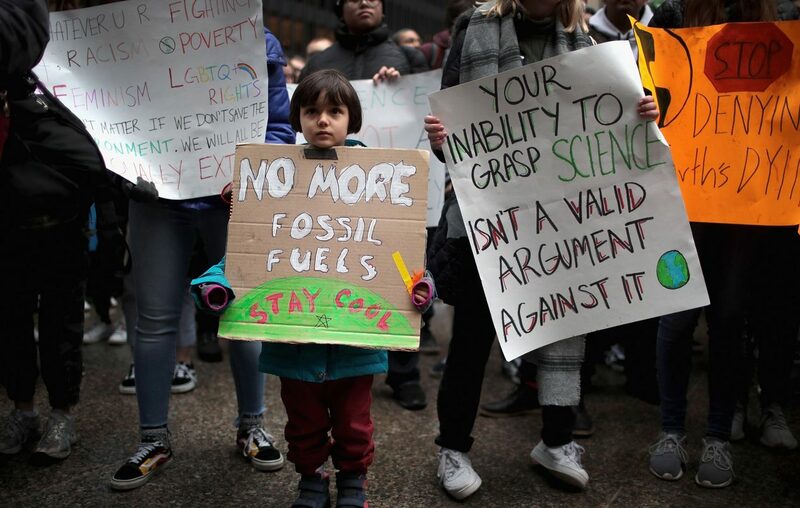 Kids know the government has known about the dangers of climate change for 50 years but has not had the courage to challenge those who gain from the crisis. They demand an immediate reduction in greenhouse gas emissions to meet the levels outlined in the October 2018 IPCC “Special Report on Global Warming” that gives global civilization 12 years before catastrophic changes lead to collapse. They also demand a Green New Deal to address climate injustice because it is the poor who will suffer the most. Do they understand what they are asking? It probably depends on their age because the youth who participated in Buffalo, as across the globe, span from 5 years through high school and college age. What they do understand, every one of them, is that their future is threatened. That their life and the imagination of growing up and having families and grandchildren, and seeing wild animals and beautiful places and not having to live through terrible droughts and fires and storms, may never happen. Listen to these young people. They have the courage to look in the terrifying face of the climate crisis; we have not. They have the courage to step out and remind all adults that their lives matter, matter more than the bottom line, more than comfort, more than our cars, more than our apathy, or is it our fears? The adults of the late 20th and early 21st century “will stand before whoever is able and willing to judge, or perhaps the silence of extinction, as a generation that willfully and unnecessarily imposed egregious wrongs on all future generations, depriving them of liberty, property, and life,” in the words of environmental science professor David Orr. And yet these young people, who are demanding climate justice, are hopeful. And astonishingly, they are asking us – you and me, and Mayor Byron Brown and President Trump – to do something about climate justice. Are we ready to hear the truth of the young? Are we capable of the most human of all actions, protecting our young and the future? Let’s stand with the kids. Lynda Schneekloth is on the board of the Western New York Environmental Alliance.